The Pivot Ready Course is an online course that will teach you how to master one of the most powerful tools in Excel, pivot tables. "It looks so easy when I see someone else do it, but I struggle to build a pivot table with my own data." If that sounds like you, don't worry, you are not alone. I have found that there are a few major hurdles with learning pivot tables that keep us stuck. So, I have designed the The Pivot Ready Course to get you unstuck. This course uses my simple step-by-step training system to help you learn pivot tables quickly. One of the most common challenges we face in Excel is making sense of data. This usually means taking a large amount of data and turning it into summary report that is easy to read and understand. We need to provide reports to management that help analyze trends and gain insights about the business. In my opinion, pivot tables are the best tool in Excel for this task. They allow us to take a large amount of data, and quickly turn it into a summary report. We can use pivot tables to save a TON of time with analyzing data, generating reports, and creating dashboards for senior management. Tasks that would normally take hours or days to complete with complex formulas, can be done with just a few clicks using a pivot table. In the screencast below I create an interactive report in 30 seconds using a pivot table and pivot chart. There's no doubt that pivot tables are an amazingly powerful tool that can save us time with our job. But, why can it feel so challenging to build pivot tables with our own data? source data in the correct layout. The key to using pivot tables is getting the source data in the correct layout/format. This is the most common mistake I see with pivot tables, and also the biggest point of frustration. We can waste time dragging fields in the the different areas, not sure of what the results will be. This leaves us guessing, and doing a lot of trial and error to get the desired results. This was my story too. When I first started with pivot tables, I didn't fully understand how they worked. I knew they were powerful and could save time, but there was a lot of guesswork. My results weren't always consistent, and I wasn't sure why...? Sometimes the Values area would default to Count instead of Sum​. Sometimes the dates wouldn't group into months and years. And I wasn't always sure which areas to drag the fields into. What I eventually realized is that it is all about the source data. So, getting the source data right is critical to making everything else work. Over the last 10 years I have learned a lot about pivot tables. They have helped me analyze data in new ways. This has not only helped save time, but also made me a valuable resource to my employers. I am able to create interactive reports and dashboards that senior management relies on to make decisions. This responsibility also gave me more freedom. Instead of being stuck doing the same old boring task, I had more time to work on fun and creative projects that had a greater impact on the organization. The Pivot Ready Course will take you from complete beginner to a pivot tables expert. I use my simple step-by-step learning system to help you gain a true understanding of how pivot tables work. This course will make you Pivot Ready. Being Pivot Ready means being able to visualize the results of your pivot table and reverse engineer it so you can get the source data in the correct layout. This will help you get your job done faster with less frustration. Do you work with data sets and reports that are exported from various systems of record (General Ledgers, CRM, ERP, databases)? Are you stuck trying to figure out how to summarize the data to create reports and analyze trends? Have you heard of pivot tables, but not fully sure how they will benefit you or how to use them properly? Do you want to build useful reports and dashboards that your boss and upper management will love? Do you want to simplify your reporting processes to save tons of time with your work to free yourself up for bigger projects and opportunities? This course is designed to equip you with the skills to quickly transform data sets and create amazing reports & analysis. The Pivot Ready Course is an online video course. This means you can watch the screencast videos any time you want, in the comfort of your own home or office. The course is is divided into 8 training modules. Each of these modules is comprised of 8-10 video lessons. You get 24/7 access to watch and re-watch the videos from work, home, tablet, and smartphone. Videos can also be downloaded to watch offline. Pivot Tables have a lot of components and features. Learning all of this can feel overwhelming. So I have broke down the video lessons into small bite-sized chunks. The lessons come with before & after companion Excel files so you can follow along with the videos and practice the techniques. This type of hands-on learning helps build your skills quickly and apply this knowledge to your own projects. How pivot tables can quickly summarize large data sets to create reports & charts. Why the layout of the source data is the most important step in creating pivot tables. How the pivot tables filter and calculate data when we add fields to the different pivot table areas. Getting the source data in the right layout/format is absolutely critical for building pivot tables. In Module 2 you will learn some of the basics to preparing your data. This includes: getting the data in a tabular format, deleting or handling blanks, converting text to numbers or dates, and using Excel Tables. These steps will become your checklist for preparing any data set for use with a pivot table. Doing the prep work up front saves a TON of time and makes pivot tables much easier to work with. In Module 3 you will learn how to insert and build pivot tables. This includes tips and shortcuts for creating pivot tables. We also learn about the Pivot Table Field List. The Field List is the control panel for the pivot table where we drag-and-drop fields to build the reports. You will learn about each Area of the pivot table, and how we can use them to quickly change the layout of our reports. This will help you take the guess work out of it. No more trial and error with dragging and dropping fields into different areas. You will be able to visualize what the pivot table will look like before building it out. 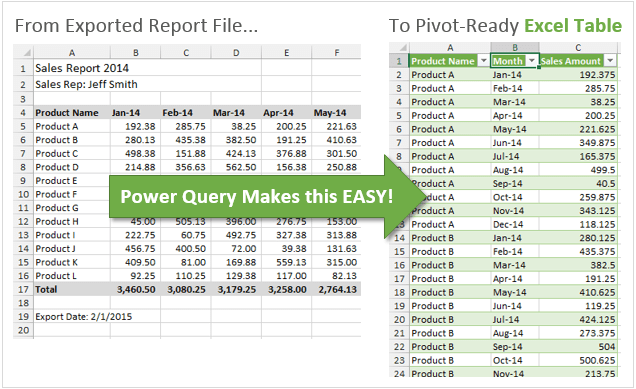 How to apply number formatting to make your pivot tables look good. The 3 different report layouts for pivot tables. How to style the pivot table with different fill and border colors. The pivot table options menu that contains 30+ settings, and which ones are important. How to change the calculation type of create percentage of total metrics in your pivot tables. Often times our source data is not in the right layout for a pivot table. If the source data isn't right, then the pivot table won't work the way we expect it to. In Module 5 you will learn how to transform your data into the right layout using Power Query . This is referred to as Unpivoting or Normalizing a data set. Power Query (now called Get & Transform in Excel 2016) is a great new data transformation tool that makes this process easy. It is available for Excel for Windows for versions 2010 and beyond. In this module I give an overview of how Power Query works, and then explain how to use it to transform our data with a series of step-by-step videos. We look at how to Unpivot or Normalize different types of reports such as Actual vs Budget reports and inventory reports. We prepare the data for use in pivot table so we can easily create flexible pivot table reports. In Module 6 you will learn how to add more data to your source range, and how to refresh the pivot tables. I explain why using Excel Tables are critical for this process. They not only make it easier to add new data, but also help prevent a lot of errors. This module will help you create systems for updating your reports with new data on a periodic basis. Getting the Tables and pivot tables setup properly in the beginning can save hours of work and frustration in the future when we need to add new data to our pivot tables. Typically our source data has columns that contains dates. We might want to create a pivot table report that groups those dates by year, quarter, month, week, etc. There are two main ways to group dates with Pivot Tables. Pivot Tables have a built-in Group Fields feature that can quickly group date fields. 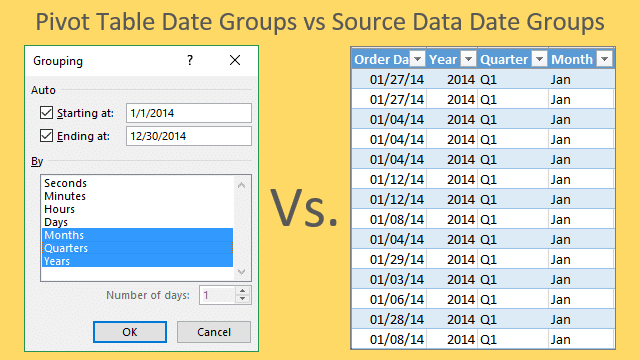 We can add columns to our source data that contains formulas to create groups. In Module 7 you will learn both of these methods, and the pros and cons for each method. You will also learn how to group dates for fiscal calendars. ​How to apply filters to the different areas of the pivot table. Creating filters that automatically filter for the current time period (week, month, year, etc.). Creating filters for multiple criteria on the values area using AND and OR logic. For example, how to apply a filter to only include transactions with revenue greater than $1,000 and quantity less than 30. Along with the videos you are also getting the Excel files I use throughout the course. You get the BEFORE and AFTER files, so you can follow along with the videos and practice the techniques. This type of hands-on learning will help you improve your skills quickly. Slicers are an awesome tool that allow us to make our pivot tables and charts interactive. Users love this feature. In this bonus module I share creative solutions for various ways to use slicers. This includes techniques like: adding a search box to a slicer, filtering/sorting a slicer with a slicer, dynamic chart labels, MTD comparisons, and much more. These techniques will help bring life to your workbooks and make them easier to use. Sometimes we have source data in multiple worksheets or workbooks. It can be challenging and time consuming to combine the data for use with a pivot table. Power Query (Get & Transform) makes this process much easier. In this bonus module you will learn how to combine data from multiple worksheets or workbooks. We look at multiple examples of how to clean up and transform the data, then combine (append) it into one large table. If you have formatted reports that look like the example above then this training will save you a TON of time! Power Query allows us to setup automated systems for cleaning up, transforming, and combining the data. New worksheets or workbooks can automatically be added to the output Table when new data is published every period. The Combine Data with Power Query Course ($97 value) is included​ as a free bonus with your enrollment. The course includes 10 tutorial videos that will teach you how simplify this process and prepare your data for use with pivot tables. Right now I'm offering lifetime access to The Pivot Ready Course for $297 $177. With The Pivot Ready Course you can watch the videos any time you want, ask me questions, and be part of a much larger community of learners. Plus, you get lifetime access to the course. This means you can use it as a resource in the future as you continue to learn pivot tables & Excel. My goal is to help you learn pivot tables so you can save time with your job and take your career to the next level. I want you to love this course and use it as a resource for continued learning. If you take the course and are not satisfied with what you learned, you can get a full refund. Complete the ﻿secure order form﻿ with your credit card information. You can also checkout with PayPal. You can use any version of Excel for either Windows or Mac. I use Excel 2013/2016 for Windows in most of the videos in the course. All the functions, formulas, and techniques explained in the course can be used on either the Windows or Mac versions of Excel, from 2003 and beyond. The bonus module on Power Pivot and Power Query will only apply to Windows versions of Excel from 2010 and beyond. All major credit cards including Visa, MasterCard, and American Express are accepted. We also accept PayPal. If you are unsatisfied with your purchase, contact us within 30 days of purchase to get a full refund. I want you to be fully satisfied and learn a lot! Great lessons on Pivot Tables. For years I have been reluctant to learn them because I heard they were complicated and took expert knowledge. You have shown me that anybody can create a pivot table. Well done. Get Started Learning Pivot Tables Today! Complete the secure order form to pay by credit card. You can also checkout with PayPal.